There are literally hundreds of species available on Tropicalfish2yourdoor many of which are rare and hard to find species. Fish are being loaded on everyday and it pays to check back frequently to avoid missing the many gems that arrive in stock. One such example is the Spoon Face Whiptail Planiloricaria cryptodon. 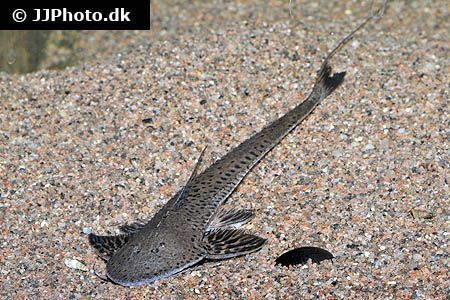 A big whiptail catfish with a distinctively spoon-shaped head. Strongly compressed from top to bottom. The upper surface is greenish-brown and covered with small black spots. The underside is pale off-white. The eyes are rather small and placed on the top of the head. a burrowing species that requires special care. It needs an aquarium with a soft sand substrate (smooth silica sand is ideal) decorated only with a some leaf litter or floating plants. Rocks and bogwood should be kept to a minimum, and placed around the edges of the aquarium only. Rooted plants are unnecessary and may even be uprooted, but epiphytes attached to bogwood or rocks would be acceptable. Feeding is much like other whiptails, but scaled upwards given the size of the fish. Bloodworms and other insect larvae are good foods initially, but to avoid nutritional imbalances these should be regularly augmented with thiaminase-free seafood like chopped cockles and minced tilapia fillet. There are literally loads of interesting fish to buy, so please do click here.and see the current lists.